Alexander "Sandy" Cutler is Chairman and Chief Executive Officer of Eaton. He is also a member of the Campaign to Fix the Debt’s National CEO Council and Steering Committee. Cutler will be discussing the efforts of the Campaign to Fix the Debt, a national, nonpartisan movement dedicated to put America on a better fiscal and economic path. Specifically, he will discuss why it is important for our elected officials to implement a comprehensive plan that addresses the long-term drivers of our debt while addressing our long-term debt and deficits, as well as how doing so will benefit the business climate of our nation, state, and region. Cutler began his career with Cutler-Hammer in 1975 as a financial analyst. After Eaton acquired Cutler-Hammer, he held various positions before becoming Eaton’s President and Chief Operating Officer in 1995, and assuming his current position in August 2000. 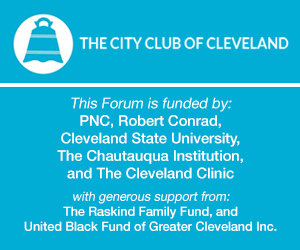 He is a board member of DuPont, KeyCorp, the Greater Cleveland Partnership, United Way Services of Greater Cleveland, the Electrical Manufacturers Club, and the Musical Arts Association. Cutler also chairs the Corporate Governance Committee of the Business Roundtable and is a member of the Business Council.